Here Is a good News for You all, Maybelline Releases Valentine's Day Special New Colossal Kajal. I know We all love Maybelline's Colossal Kajal very much and if its quality is going to be improved then it will double our love for this Colossal Kajal. 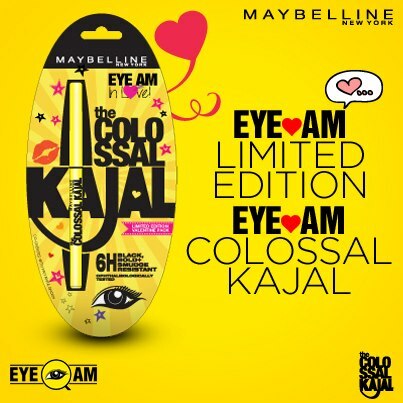 So show and share your love to the Valentine's Day Special New Colossal Kajal from Maybelline here. Maybelline asked girls on our page to show us their creativity and send in their designs for this special pack. With over 150+ entries received, our Limited Edition Valentine’s Day Colossal Kajal is now all ready, and waiting to be bought by millions of girls in India! It's Black. It's Bold. It's Smudge free and guess what? It's now available at select Maybelline New York counters!